Monday May 8th 1922 There was a hard rain last night. I was over to Gracie awhile. Down town in afternoon. Art McCallister here in evening. I wrote Hattie and Mary. I will go home by Des Moines. Tuesday May 9th 1922 A telegram from Hattie said William and Mary would not be in Des Moines this week. I was down town in AM. Wrote some letters. Rested awhile. Evening at my room. Hatties birthday. Wednesday May 10th 1922 I fixed up a box to send home. Was in my room most of forenoon. Went to PO and down town. Later got letter from Alice Condon wanting me to come there. nice day. Thursday May 11th 1922 I packed in forenoon. Was over to Art Mc-- at noon. Jane & Art went with me to the station. Left on Santa Fe at 3.55. A nice train quiet car supper at Arkansas City. To bed early. Friday May 12th 1922 I had a good nights rest. Reached K City at 7.15. Had breakfast. Left for Des Moines at 9 AM. Reached there at 5.25. PM. William met me. We had supper and went to fine picture show. Spent the night with The Williams girls. It was 36 years today since Will and I were married and 7 since we took our needed wedding trip. 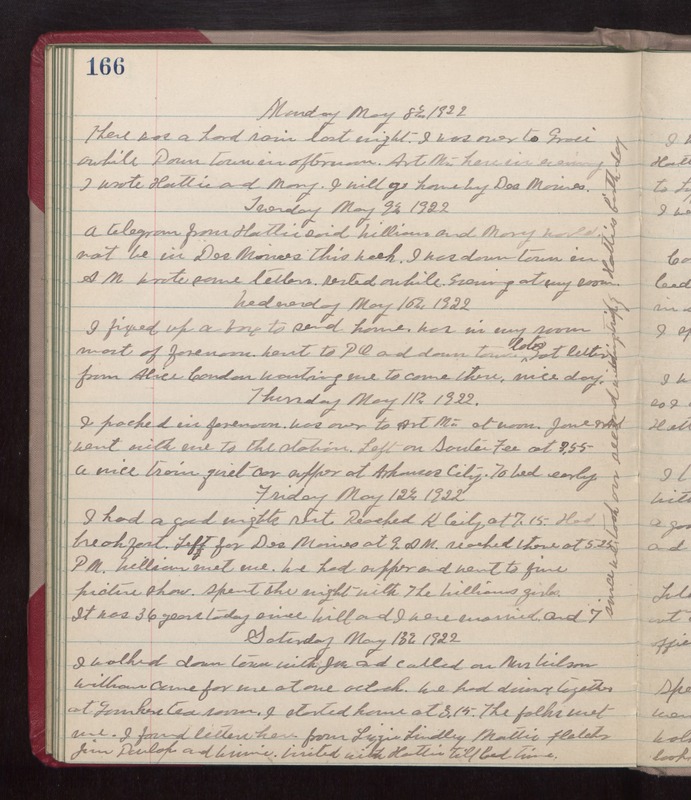 Saturday May 13th 1922 I walked down town with Joe and called on Mrs Wilson. William came for me at one oclock. We had dinner together at Gimkers Tea Room. I started home at 3.15. The folks met me. I found letters here from Lizzie Lindley, Mattie Fletcher, Jim Dunlap and Winnie. Visited with Hattie till bed-time.